Pundits claim the system is the hardest to play against, especially if the wingbacks are very fast in attacks and can cover the defence very well. If a team is precise in attack and accurate in front of goal, even the strongest defence will crumble. Conte made the switch after Arsenal thrashed them 3-0 in September. The bold tweak in formation and the momentum gathered undoubtedly won that league title. Victor Moses and Marcos Alonso became the major driving force for the attack from the wings and boy did they do a good job. The three centre half players in Gary Cahill, David Luiz and Cesar Azpilicueta were outstanding. The two defensive defenders in N’Golo Kante and Nemanja Matic allowed Eden Hazard to roam in attack. Either Willian or Pedro supported Diego Costa upfront and the results are there – with Chelsea not only winning the title, but also playing the most attractive football, with this site reporting that their tickets were the most in-demand for the 2016/17 season. Opta Stats report that teams used this formation 135 times compared to just 22 the previous year. With Manchester City getting quality options that can play as wingbacks, this system should pay off as Gabriel Jesus is a natural goal poacher. Spurs used this same formation to defeat Chelsea 2-0 last January. As the wingbacks are exposed, long balls can be effective in cancelling them out. 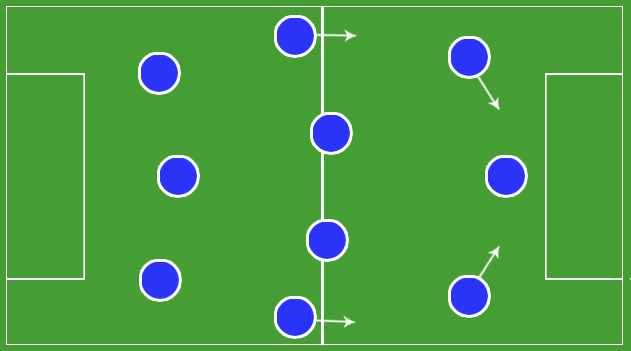 When the defenders return to form a back formation of five, more space is freed up against them. Christian Eriksen was very creative in finding Dele Alli who scored both goals. The high press up play also helped Spurs in that game as well. For Man United, Ander Herrera man-marked Hazard out of the game to kill the creative force. The man-marking strategy if well deployed can be used to hurt the 3-4-3 formation. Crystal Palace ruthlessly attacked the Blues instead of waiting to be ripped apart by the wingbacks. They made the best use of their chances and Chelsea lost. As the Premier League reopens, more teams would most likely use this method. But others also have the knowledge of how to counter it as well.